With our experienced workforce, we are engaged in trading and distributing a wide range of CNC machine. 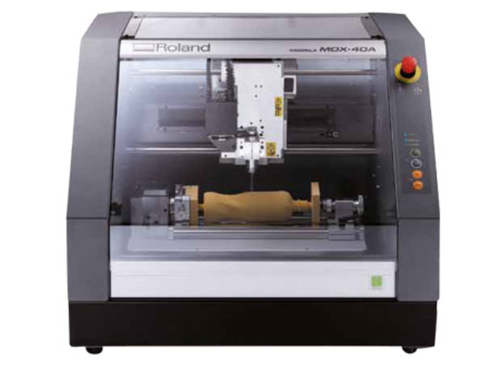 The Roland MDX-40A CNC machine combines the advanced capabilities of a Subtractive Rapid Prototyping®(SRP) system with the ease-of-use of a bench-top CNC mill to provide product engineers and designers with a powerful 3D milling device. Offered at less than half the cost of additive systems, MDX-40A CNC mill produces affordable and highly accurate prototypes from a wide variety of non-proprietary materials with greater precision and excellent surface finish. Unlike other CNC machines used for rapid prototyping, the compact design of the MDX-40A is the perfect fit for any office and classroom space. It can even function as a CNC engraving machine. We “Indian Power Control” incorporated as a Sole Proprietorship company at Chandigarh (India) are the reputed Trader, and Supplier of a premium quality range of Solvent Printers, Eco Solvent Printers, UV Flatbed Printers, Laser Engraver, Printer Ink, Online UPS, Desktop Engraver, etc. Since our inception in the year 1998, we have received rave reviews for our excellent quality from our reputed patrons from all over the nation. This range is procured from the leading market vendors and is offered under the brand name Apsom. Banking upon the in-depth experience of our mentor “Mr. Hitesh Pathak” we have been able to create a strong foothold in this industry and gain huge number of clients.